By the time 2016 ended, Duchess Catherine was evolving day by day. Whether it was her family or royal role or fashion front, Catherine was moving forward strongly and steadily. In 2011 we saw a young girl in love with a Prince, looking forward to a life that will never be normal. 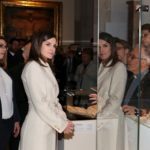 In 2017, we were looking at the most popular Royal Lady with a confident persona. 2017 started with an announcement from Kensington Palace stating that the couple will be increasing their official work on behalf of Queen as William will be leaving his role with East Angelia Air Ambulance in the summer. 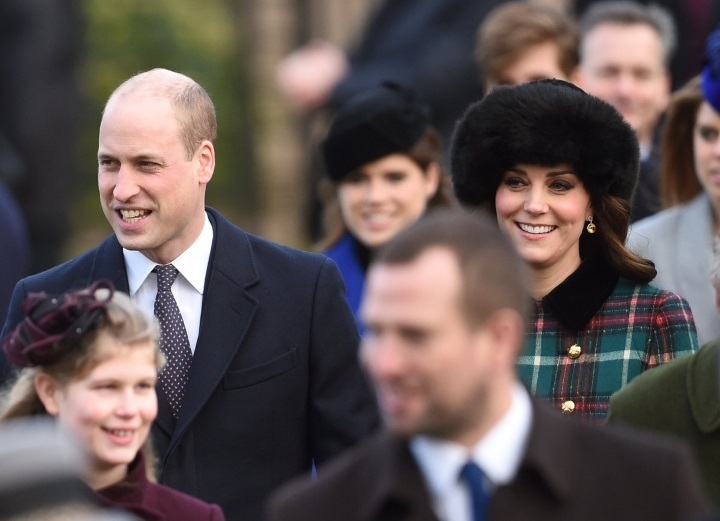 William and Catherine were living at Norfolk as much as they can trying to give George and Charlotte normal childhood away from media and public scrutiny. But it was coming the end as George was going to start his school in September 2017. 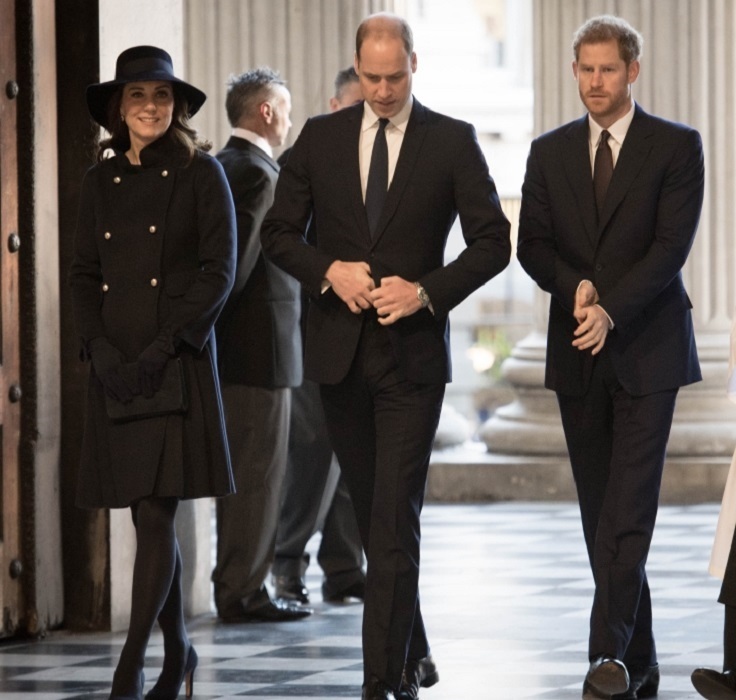 On January 08, 2017 William and Catherine joined Her Majesty and Prince Philip with Middleton family for Sunday church service in the Norfolk. 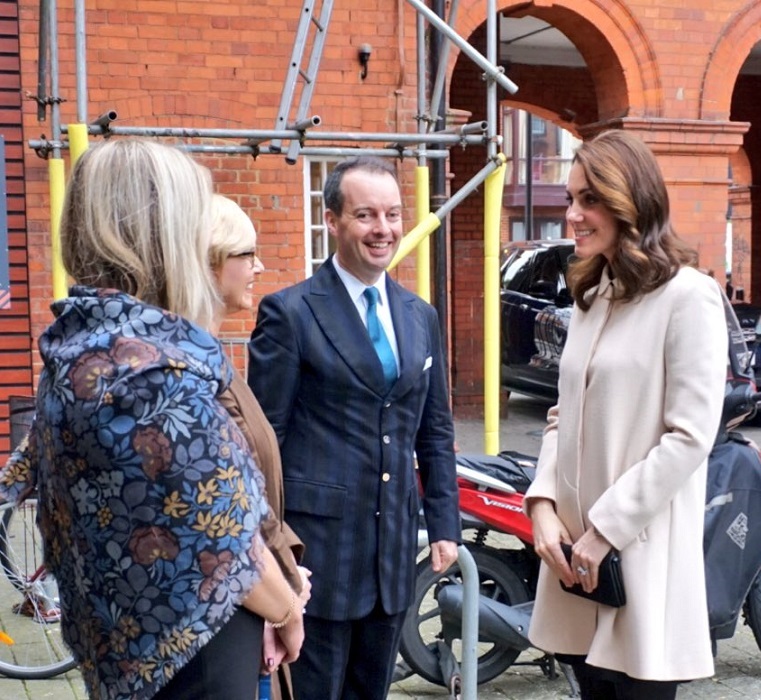 Duchess wore Sportmax Long Belted Coat with L.K. Bennett Sammi Blue Silk Scarf, Sumac Luxury Alpaca Fur hat, Emmy London Valerie carbon pumps. Duchess was steadily working for the cause close to her heart – Mental health. In January she undertook series of engagements to promote the cause. Duchess, whose voice was unheard until her engagement interview and was being criticised as only seen not heard, was actually putting her words where they were more needed. During engagements she was connecting to the parents on personal level sharing her own experiences of parenthood. While visiting Ronald McDonald House Evelina London Duchess said, “Having baby is a life changing moment”. On Febuary 22 2017, Catherine made her one of the most awaited debute. She joined William for BAFTA – the British Academy of Film and Television Awards. Duchess wore the bespoke version of Alexander Mcqueen Long Tier Violet Jacquard Gown with large statement pink diamond earrings, Queen’s diamond bracelet, Prada Wavy-Cut Suede Nero Pumps and Alexander McQueen Heart-Clasp Satin Box Clutch. On February 27, 2017 Catherine joined William and members of royal family for a reception – ‘UK-India Year of Culture’ hosted by the Queen at Buckingham Palace. Duchess wore Erdem Rhona pleated dress with Oscar de la Renta Platinum Lamé Cabrina pumps, Anite Dongre pink city earrings. In March 2017, Duke and Duchess marked another first, The couple officially visited city of Love – Paris for the first time. They have been to France before on official engagements but never been to Paris. 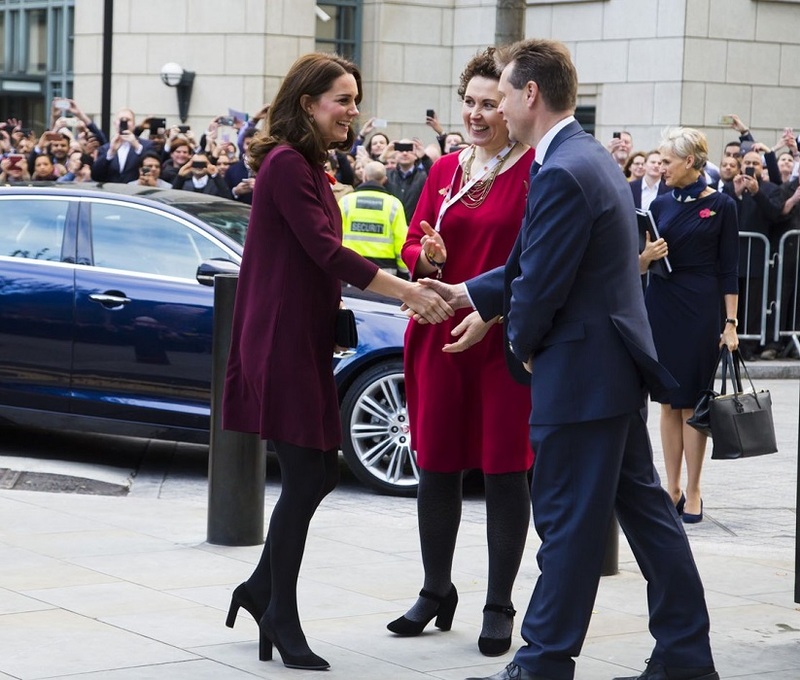 Duchess was elegant during two days visit to the fashion city. Upon arrival Duchess, who just came from St. Patrick’s day parade with William, was wearing Catherine Walker Coat, Monica Vinader Siren earrings, Gianvito Rossi Suede green pumps, UFO green clutch and her Cartier Ballon Bleu watch. 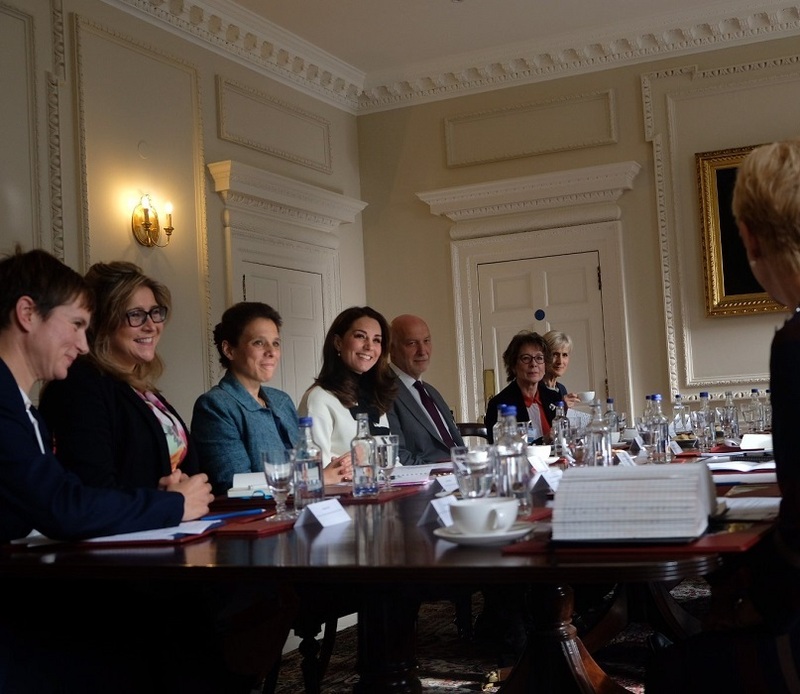 Later on Duchess joined William for an event hosted by the British Ambassador at his residence. Catherine wore bespoke piece is by Alexander McQueen black sleveless dress paired with Gianvito Rossi Ankle Strap Suede D’orsay Pumps, Large pearl Balenciaga earrings, necklace and ring and Cartier Ballon Bleu watch. 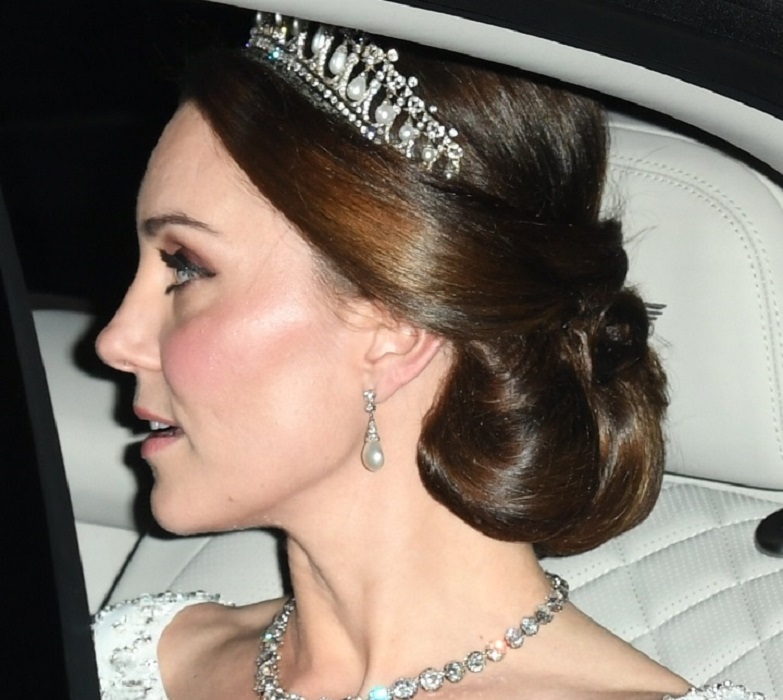 In the evening, Catherine attended a galal dinner wearing Ice blue gown with intricate embellishment and sheer detail from Jenny Packham with Oscar de la Renta Platinum Lamé Cabrina pumps, Jenny Packham Casa clutch, Queen’s chandelier diamond earrings and diamond bracelet. On Day 2, Catherine chose to debut the most awaited fashion label- Chanel. She wore Chanel Tweed Coat Dress paired with Chanel black belt, Chanel Calfskin Bag, Tod’s Fringed leather pumps with Cartier’s Trinity Earrings and Cartier Trinity Tri-Ring Necklace and her Cartier Ballon Bleu watch. 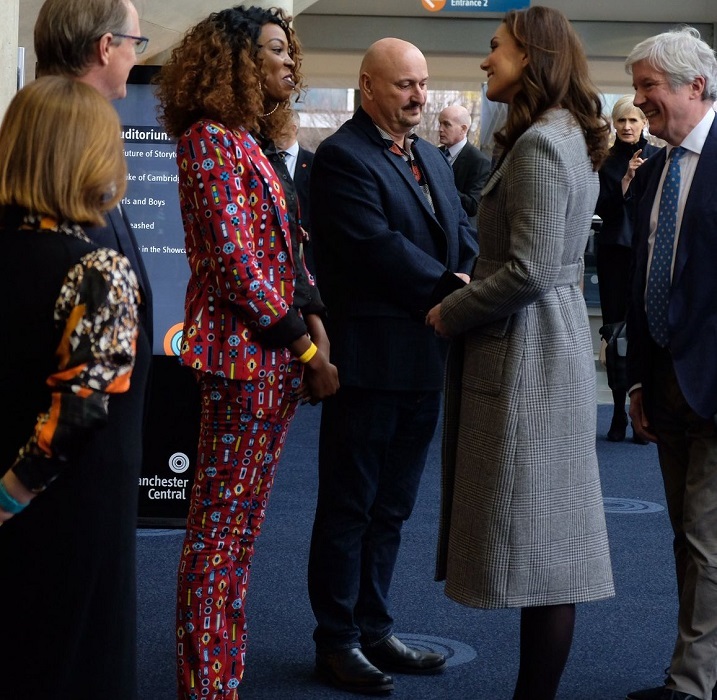 Duke and Duchess along with Prince Harry gave a royal send-off to the 2017 Virgin Money London Marathon runners on April 23 2017 as the patron of Heads Together Campaign that was selected as the charity of the year. Catherine was wearing Regatta Professional Perfect Softshell Jacket, Superga Cotu Trainers, Ray-Ban Wayfarers and Kiki McDonough Lauren earrings. On May 11 2017 Catherine marked another first, She made a solo visit to Luxomberg for the first time. 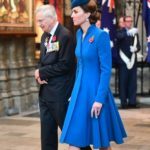 Duchess wore Emilia Wickstead Coatdress with L.K. Bennett fern pumps, Etui bags, Mappin & Webb Empress pendant and Kiki McDonough Blue Topaz and Diamond Drop Earrings in White Gold. 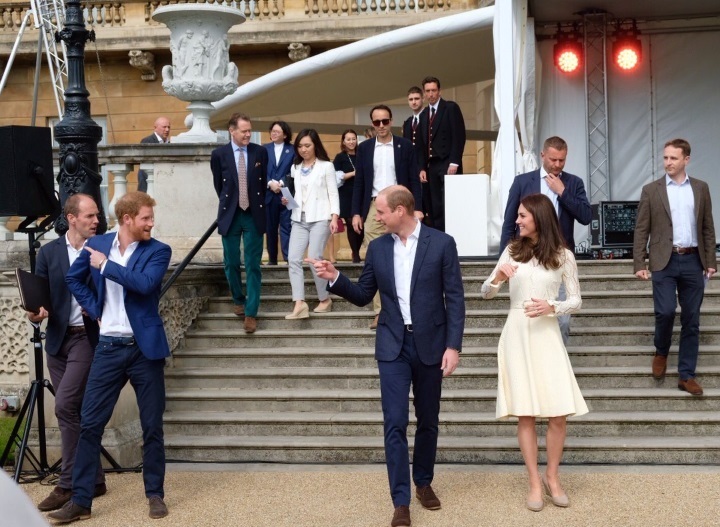 Duke and Duchess of Cambridge threw a special party along with Prince Harry at Buckingham Palace. 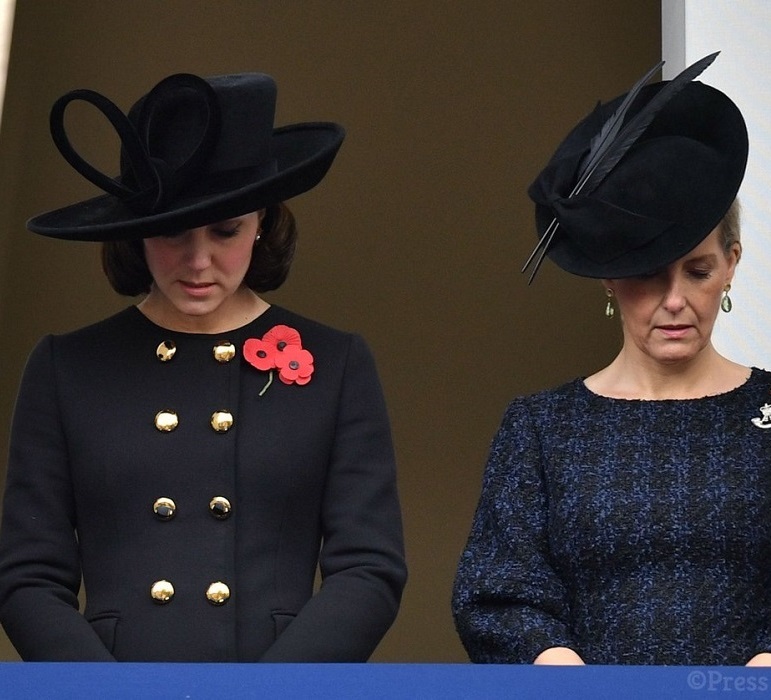 The royals welcomed the children of army men and women who died serving in the armed forces. 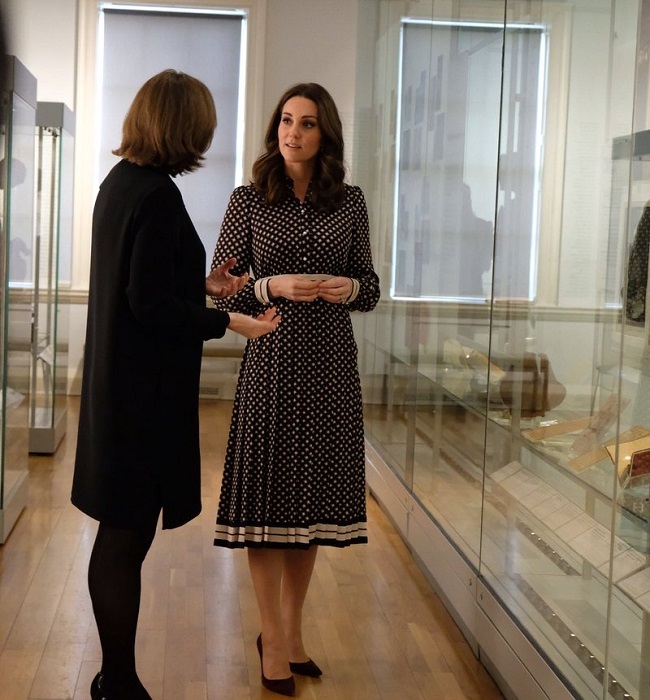 Duchess wore Chloe See long sleeve jersey dress with Acne Studios Leather Waist Belt, Monsoon Fleur Wedges and Annoushka pearls and Kiki McDonough hoops. On May 20, 2017 Duchess marked another personal milestone. Her younger sister Pippa Middleton married to James Matthews. Prince George and Princess Charlotte stole the day with their cuteness as pageboy and flower girl. 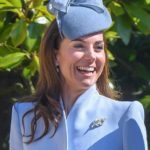 Duchess chose a very understated yet sophisticated Alexander McQueen dress with Jane Taylor hat, Kiki McDonough Morganite and Diamond earrings with Gianvito Rossi suede praline pink pumps . In May 2017, William interviewed by Alastair Campbell for British GQ as part of the Heads Together Campaign where he talked about his family and mother. William was photographed with his family giving a glimpse behind the closed doors of the palace. 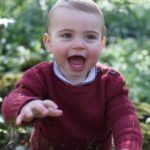 The pictures of George, Charlotte and Lupo playing while William and Catherine looking were taken in April by Norman Jean Roy. Duchess chose a very relaxed and casual look for the photograph. she was wearing J Crew Italian Cashmere Long T-Shirt with Mappin &Webb Empress Pendant with earrings, Superga Cotu Trainers. July 2017 had another series of first. 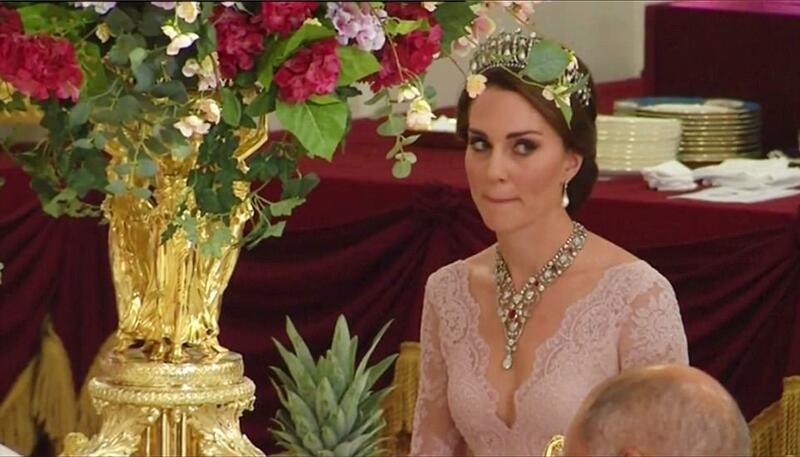 Duchess attended her first royal state banquet. She joined Her majesty and members of Royal family to welcome King Felipe and Queen Letizia of Spain for their first state visit. Duchess wore dusty pink Marchesa evening gown with Cambridge Lovers Knot tiara, Princess Diana’s diamond and pearl earrings with Ruby and Diamond Floral Bandeau Necklace on loan from Queen. Duke and Duchess of Cambridge undertook another royal tour in July. 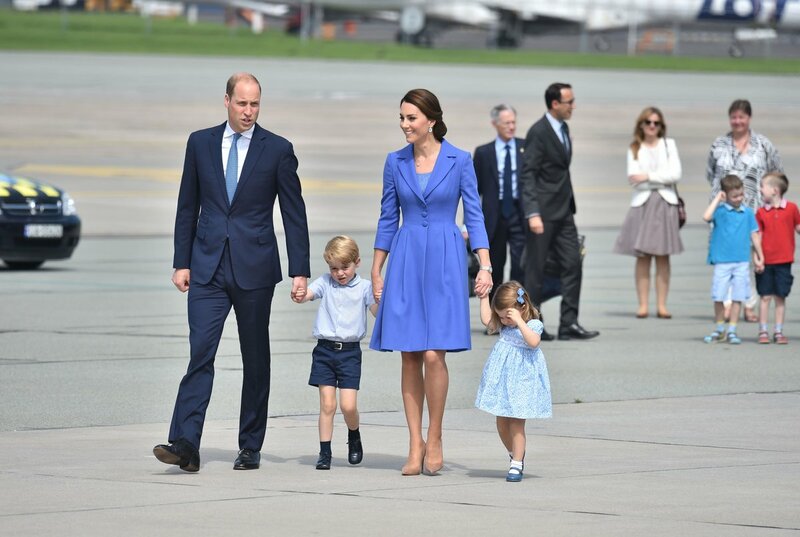 The visited Poland Germany with Prince George and Princess Charlotte. The 5-days visit to the both countries were on the request of Foreign Office and was considered Soft BREXIT visit. 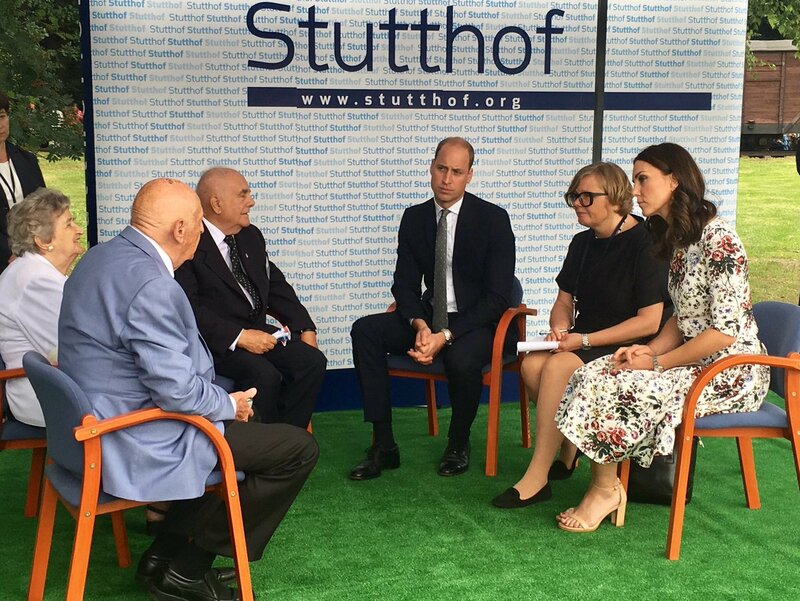 During the Poland visit the couple met the survivors of Nazi camp in a moving visit to Stutthof. The royal tour was also Princess Charlotte’s first tour. A look at Duchess’ wardrobe during the visit. 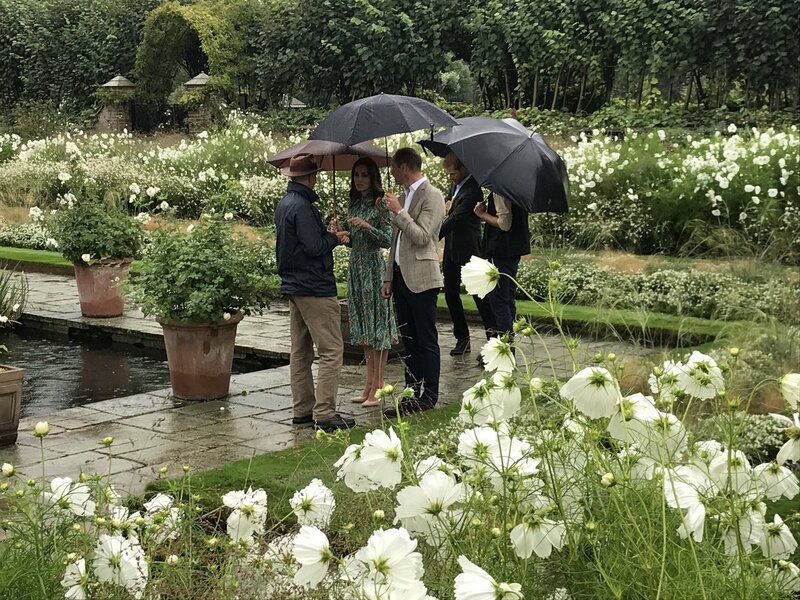 On August 30 2017, Duchess joined Prince William and Prince Harry at White Garden in Kensington Palace to pay tribute to Princess Diana on her 20th Death Anniversary. She wore a beautiful floral printed mint green Prada Dress, Monica Vinader Siren Wire earrings, L.K. Bennett Fern pumps. September 04 2017 brought another unexpected happy news. Duchess of Cambridge was expecting her third child . 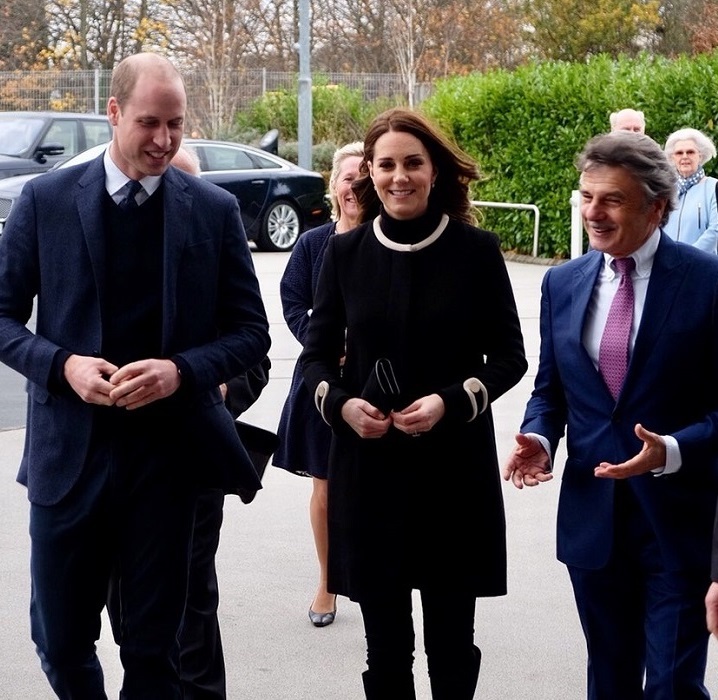 The royal watchers were waiting for the Duchess of Cambridge to see on her first royal engagement after autumn break at Hornsey Road Children’s Centre in London. Out of Blue the news of cancellation came. Catherine was once again suffering from Hyperemesis Gravidarum – a very acute morning sickness. Prince George marked his first big milestone on September 07, 2017. He started full time school at Thomas’s Battersea in London. Due to her morning sickness, Duchess was not there publicly to drop George at School. George came to school holding his father Prince William’s hand and was received by the Head of the Lower school. The Cambridge family also base their primary residence at Kensington Palace in September. 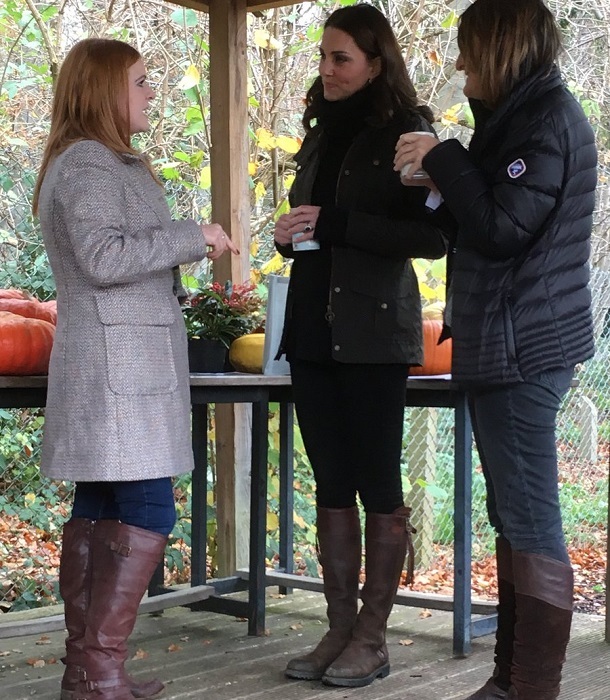 Duchess’ first appearance since announcing third pregnancy was on October 10 2017 at World Mental Health Day celebration at Buckingham Palace. Duchess wore Temperley London’s ‘Eclipse’ Lace Dress with Gianvito Rossi black Suede Pumps, Mulberry Bayswater clutch and Kiki McDonough blue topaz and diamond drop earrings. Catherine’s first solo appearance since her third pregnancy announcement was on October 31 2017 at the Lawn Tennis Association. 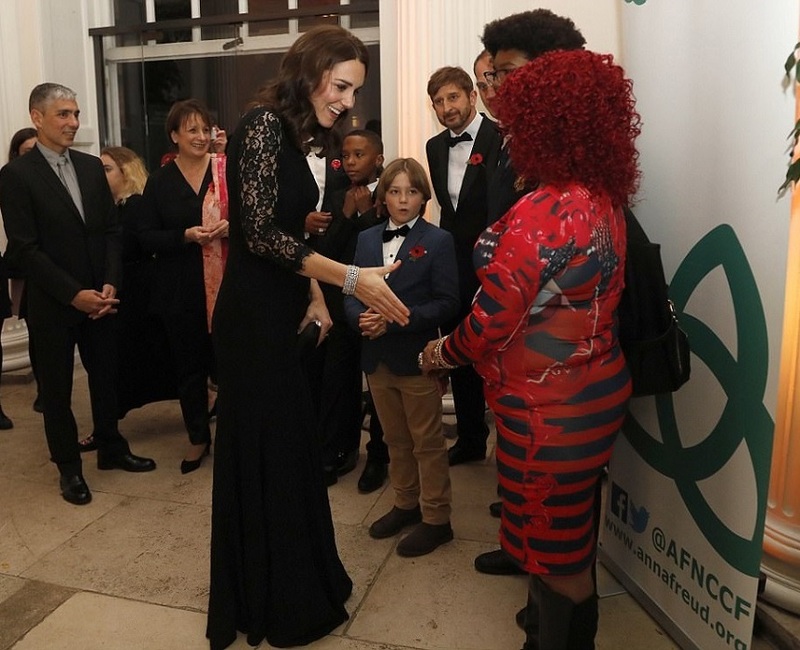 Duchess was wearing Monreal London Tuxedo pants, Play Brave Clarice Track Jacket, Nike Air VaporMax Flyknit sneakers and Kiki McDonough Grace White Topaz and Diamond stud earrings. The year ended with Duchess undertaking series of engagements through November and December and Christmas at the Sandringham.